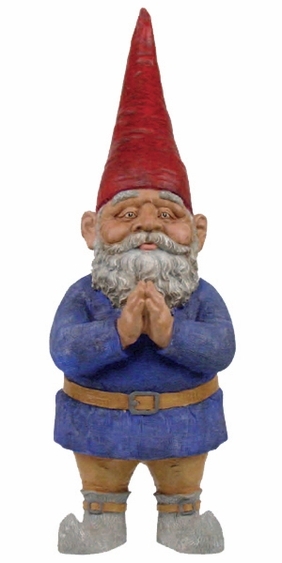 If regular garden gnomes are a bit small for your taste, in peaceful praying stance, you'll absolutely adore our Large Mordecai Garden Gnome! He has that classic gnome look you love, complete with little pointed shoes, a tall pointed cap and a belted tunic outfit. And of course, Mordecai also sports a luscious gray beard! He's just so utterly charming that we can't wait for you to see him in person. Unlike regular gnomes, our large gnomes stand 32" tall, which helps them to stand out even if you have other yard decor or a particularly lush garden. With Mordecai the large garden gnome, you'll feel like you're getting twice as much gnome to love! Plus, he's made of cast resin stone, making him incredibly weather-resistant.